FOOTLAND Ｚ | FOOTLAND INC. 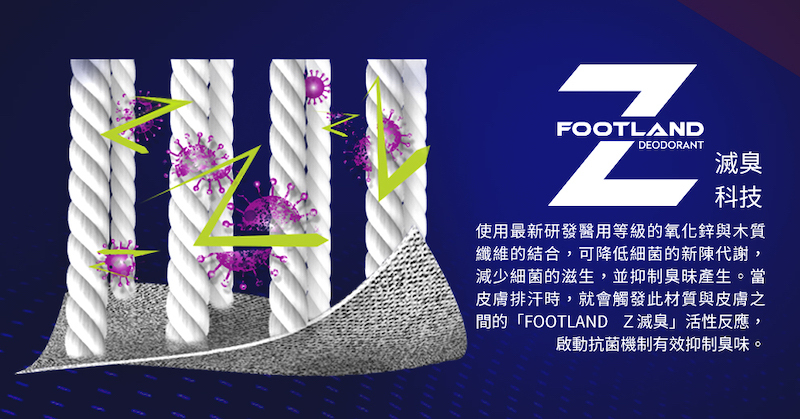 Right now, we are glad to launch『FOOTLAND Ｚ』, the deodorant technology from FOOTLAND. It combines the zinc oxide and wood fiber which reduce the metabolism of bacteria to reduce the growth of bacteria, and inhibits the smelly. While you are sporting perspires or during wearing socks, the FOODLAND Z Technology will trigger the function technology reaction between the material and the skin, activate the antibacterial mechanism, and effectively suppress the odor to provide the stable quality and comfort function.